Even back in 16th Century Europe, people sometimes had trouble sleeping. Fortunately, they had discovered herbs and minerals possessing chemical properties that had a calming effect on the central nervous system that would help them relax. One of the most beneficial of these calming natural medicines is the chamomile plant. To this day, the calmative properties of chamomile help millions of people worldwide relax or prepare for a better night’s sleep every single day. In fact, it’s hard to find an American household that doesn’t have some packets of chamomile tea tucked away somewhere in a kitchen cabinet. What Gives Chamomile its Gentle Properties? Introduced in Europe in the 1500s, chamomile had been used in ancient civilizations as a digestive aid as far back as the 1st Century, A.D. It’s a perennial, flowering plant that grows up to 20-inches in height and boasts a pleasant aroma. Chamomile can be grown in most temperate regions of the world, although it’s native to parts of Northern Africa and Western Europe. Although there are a few varieties of chamomile, most have sedative properties and some are noted for their ability to relieve inflammation. Researchers have determined that chamomile acts as a sedative because it apparently contributes to an increase in the body of a natural chemical called glycine, that is known to have a relaxing effect on muscles and the nervous system. Although no cure exists for RLS, chamomile can be an integral part of a patient’s at-home strategy to cope with the symptoms of the disease, especially sleeplessness. 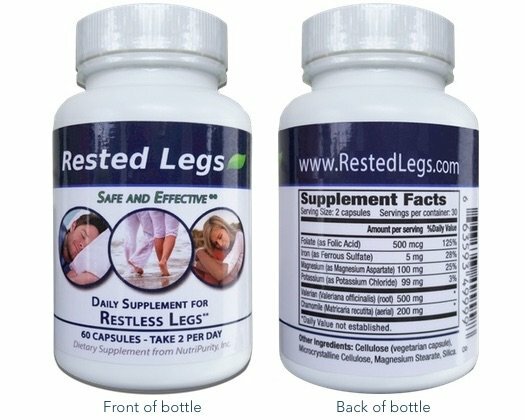 Rested Legs™ contains an appropriate amount of chamomile root powder. Other recommended coping strategies include regular light-to-moderate exercise, healthy nutritional choices, a healthy sleep regimen, support groups, meditation and other relaxation techniques and abstention from caffeine, alcohol and some over-the-counter cold medications. In addition to providing relief from sleeplessness, chamomile has been known to relieve hay fever, reduce the severity of menstrual cramps and muscle spasms via one of its naturally occurring chemicals (coumarin). The use of chamomile is contraindicated during pregnancy because it has been known to cause uterine contractions. You should also avoid chamomile if you are using blood thinning agents.